This conference explores ways we can support people who hear voices whilst involved with the criminal justic system – reducing risk and promoting recovery. 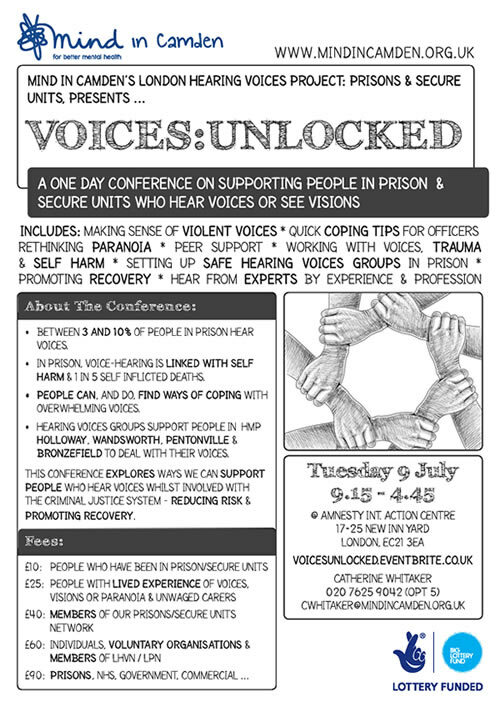 Hear from experts by experience and profession, including: Facilitators from HMP Holloway, Wandsworth, Pentonville & Bronzefield, the Mind in Camden Prison Project Team, Jacqui Dillon, Dr. Dave Harper, MAC UK & more. Using eventbrite, you can pay by credit card, paypal, cheque or on the door.